This poster illustrates 101 species found offshore in the neritic zone, from the surface to depths of 200 metres. 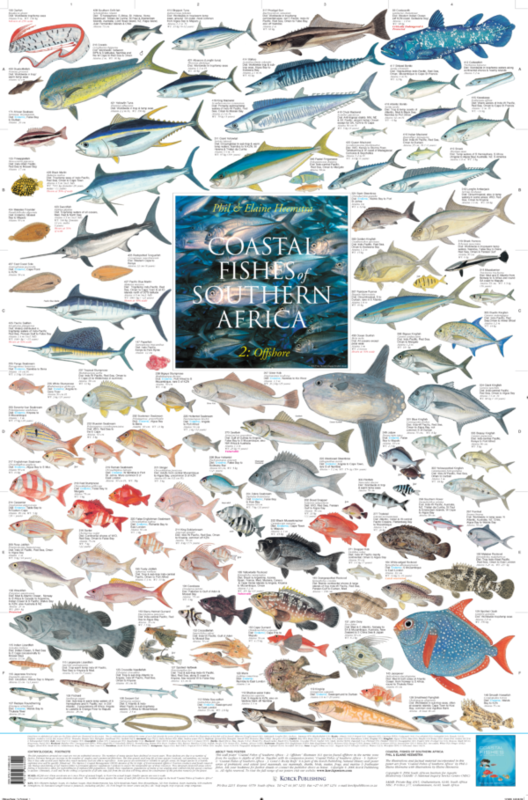 Among the fish families illustrated on this poster are: bonito, gurnard, jobfish, kingfish, kob, lizardfish, mackerel, marlin, rockcod, seabream, steenbras, stumpnose & tuna. While spectacularly colourful and varied, the fish populations around the southern African coast are not an unlimited resource. Numbers of many species have declined in recent years due to several factors, foremost being an increase in the number of anglers and commercial fishermen. The slow growth and long life of some species like rockcod , red steenbras etc means that it takes several years before maturity is reached and the species is able to reproduce. The distribution of some species is concentrated in specific areas and larger specimens in a heavily exploited area are frequently caught before they are able to breed. The accurate and beautiful fish paintings are the work of artist Elaine Heemstra. This poster will adorn any wall at home, in the waiting room, at the office or in school or university. It will make a perfect gift not just for people interested in marine fishes but for nature lovers in general.